When the day came, I did some final checks, lock up all the possible entry points, and made my way to the specified meeting point. Just to be safe, after taking more-than-sufficient amount of money for the whole trip, I had deposited all the money that was lying under my parents' bed into my bank account which I can withdraw overseas from. Of course, since it's a huge amount and could possibly withdraw overseas, I had to head to the bank the day before. This luggage bag is big and heavy, good thing it has wheels. The meeting point was around the newsstand of the busiest station. The reason why I chose this place was that it's not so crowded and that the only train line that stops at stations outside the city that is transferable to several other lines in the direction of the international airport. 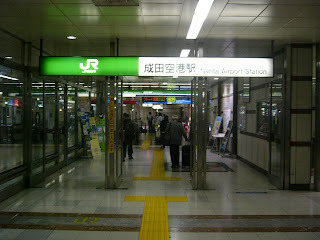 Besides, I checked where my classmates are staying and that they would have to pass through this station anyway. It seems that I am early and that there is no one else here. A familiar voice called me. It was Saeko and, behind her, the twin she calls Mamiko. Me: Oh, Saeko. You're early. Where are the others? Saeko: All of our classmates are on the way now, but Aiko-chan is having problems bringing her cousins here, so they could be late. They are too excited. After some time, all of my classmates had arrived. What is Hirano-san doing that is taking so long? It's now some time past the meeting time, and everyone is getting impatient. I had counted delays like this as part of the travelling time. At last, they arrived. She came with 3 kids: 2 boys and a girl. The boy's ages seem to be some years apart, and with the girl's age in between theirs. They seem quite playful with each other and don't seem to be aware that Hirano-san is joining us for the journey despite their parents being informed in their presence. They ignored us. Me: Well, I know it would be appropriate for us to introduce each other now, but we would be having a long trip to the airport and again on the plane to that country. On top of that, the train would be arriving and departing in less than 5 minutes. So, here are the train tickets. I passed everyone the tickets, boarded the train, and found a seat. People looked at us for a while. Was it because we are traveling in a large group, or was it because of the children? The train arrived as soon we reached the platform. Now that we are on the train towards the capital, the ride would be more than enough to introduce everyone. Hirano-san started the introduction. Hirano-san: Okay, these are my cousins. They are still quite young and playful though. So, forgive them if they are rude. (turns to them) Go on, introduce yourselves to these people. Except for the oldest boy, who introduces himself first, they seemed rather shy. Boy 3: I'm Shin'ichi, the oldest guy in the family. Girl 4: My name is I-Izumi. N-Nice to meet you all. None of the three children mentioned their family name, but no one (except me) seem to notice. Everyone, except me, fell asleep and had to be woken up again when reaching the transferring station. I can't, because I have to pay attention to see if the station we want to alight at is approaching. To tell you the truth, I wasn't even sure if I fell asleep as my eyes kept trying to shut close with my head moving in random directions, and at the same time, know every single station that we went past. The train soon pulled into our last transfer station, where we would finally take the train towards the international airport. The platform wasn't crowded, but there are a lot of people walking about at the entrances and transfer areas. Looks like we have to keep an eye on each other, especially Hirano-san's cousins. I reminded everyone that we are on the way to catch the plane at the airport, so we could explore the capital on the way back. Announcement: The train heading towards the international airport will be departing quite soon. All passengers who are heading there, please board the train now. It seems that the train that heads to the airport is already at the platform when we reached there. After about an hour, we finally reach the airport. Everyone was excited as most of them have not even been to the airport before, let alone gone overseas. We then made our way to the departure area of the South Wing at Terminal 1. As I proceed to collect our tickets, the lady at the counter asked for all of our passports before she could print the tickets and they did. I checked the names on their passports: I noticed that all of Hirano-san's cousins has Miyazawa as the family name and that her given name is indeed Aiko, as mentioned by people close to her. The birth date of the oldest of her cousins clarifies on my doubts as to whether he is still 12, as he is in the first year of middle school, and his birthday is just a few months from now. Lady at counter: Okay, so here are your tickets. The immigration counter is that way. I could have bought first class tickets. But looking at the people I'm travelling with that has children, economy class is better with reasons including not disturbing people at the first class area. After checking-in our luggage and clearing immigration, we proceeded to board the plane. We had to board the plane about 30-45 minutes before the departure time. A bit earlier to get past security and the people queuing up in front of us. The seat belt indicator was soon turned on after what seemed forever and we soon had them on. Some of them are saying about their fear of something wrong happening. There are some stuff attached to the chairs that I don't really know how it works or require something that I don't have. The plane soon started to take off. I could tell by the staff closing the the doors where we entered. Announcement: Hello, this is the captain of this flight speaking. We are now departing from here to that country. Please ensure that your seat belts are tightly secure. The plane is scheduled to arrive there in 6 hours. Thank you for travelling with our airlines. 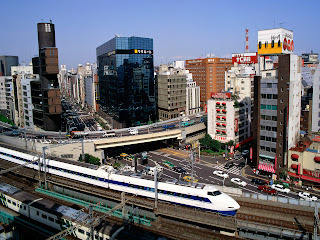 The plane was from low speed and suddenly accelerated to a very fast speed, even faster than the train. As it was travelling at high speed, The front was tilted upwards for quite a while and soon levelled. The temperature seemed to be lower that it was earlier. I looked out at the window (along with anyone who never take the plane on a regularly) and saw that the ground is very far below and saw clouds hovering below us. Everyone was excited, though some were uninterested or scared. During the take-off, it feels as though I had left my body behind.